It’s only natural to want to connect with your customers—but there is no denying that today’s customers are constantly changing with each passing day. They jump from device to device (often using more than one screen at a time) and constantly use different channels to stay connected throughout their day. Put simply, to communicate effectively and build relationships with today’s consumers, delivering useful, relevant messages how, when and where consumers want them isn’t just a nicety but a necessity. You need personalized marketing at scale and the right technology to support your goals. But how are today’s most successful CMOs using technology to deliver the authenticity of personal, human connections to win the hearts and minds of their customers? 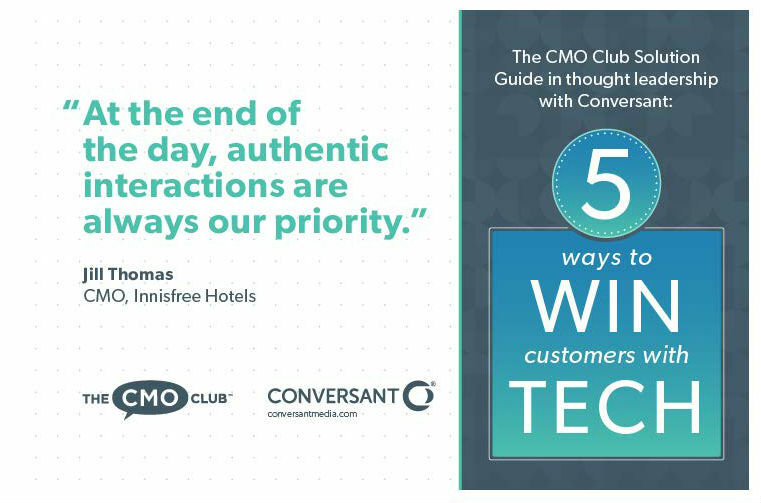 To answer such a question, The CMO Club, in thought leadership with Conversant, recently developed a new CMO Solution Guide: 5 Ways to Win Customers with Tech. This new study presents the findings from a survey of over 60 CMO’s along with in-depth insights in 1:1 interviews with global marketing leaders representing B2C and B2B mid to large size organizations across a variety of industries. The CMO’s interviewed include Edward Jones, Innisfree Hotels, TD Bank, TIAA, Studio Movie Grill, and Western Union. The study shows a clear view into how top marketers establish goals around digital technology and overcome challenges in order to use technology to create seamless and personal customer connections. Challenge: How can you use technology to truly know each customer? Solution: Unite each customer’s data and activity into one view. Challenge: How do you accurately recognize your customers across devices? Solution: Ditch cookie-based targeting for person-level knowledge. Challenge: How do you tailor messages to each customer over time? Solution: Dynamically personalize each message—in real time. Challenge: How do you see the full impact of your digital efforts? Solution: Measure what matters: incremental sales. Challenge: What if your technology falls short? Solution: Automate your digital marketing with the right end-to-end technology. If you’re among the 75% of marketers who don’t have the technology or don’t use it effectively enough, now could be the time to have a talk with your team and vendors about how to get it right. To get all of the insights, view the full CMO Solution Guide: 5 Ways to Win Customers with Tech HERE. Conversant® is the digital media arm of Epsilon and a leader in personalized digital marketing. They help the world’s biggest companies grow by creating personalized experiences that deliver higher returns for brands and greater satisfaction for people. They offer a fully integrated personalization platform, personalized media programs and one of the world’s largest affiliate marketing networks—CJ Affliate by Conversant®. For more information and solutions, please visit Conversant or follow them on Twitter @Conversant.